December is a hectic month. 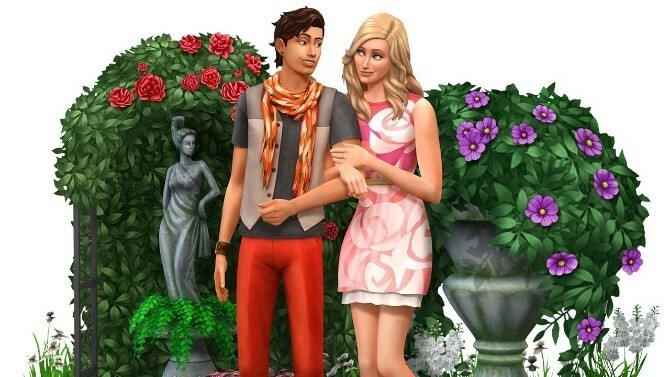 You may think a review is long overdue, especially for an avid "The Sims" player, but I have to admit: I wasn't impressed with "The Sims 4" when it was first released. Granted, I had never been able to properly play its predecessor because my PC simply couldn't run it. When "The Sims 4" was released in 2014, I had just upgraded to a mid- to high-end PC and I could finally run "The Sims 3" with all DLC, and without much trouble. So the base game wasn't very interesting to me at that point. I must've played it for a few hours, but got bored with it rather quickly. I decided to let it be for a while, at least until more content was available. And here we are, it's 2017 and the game now has a couple more features that could be interesting. Still not that which would interest me most (which would be weather/seasons, and pets), but oh well. Note that I have the game with all DLC. It started out fair enough I guess. I created one sim. Didn't spend too much time on her, I just wanted to test the game so I basically randomized her appearance until I liked what I saw, changed a few minor things and gave her personality. Overall, I didn't think CAS (Create-a-Sim) was very much improved, compared to TS3. Sure, there are different hairstyles and outfits. Body shape and face can be changed, but the process was "meh" to me. If you don't want to pick a preset, careful dragging is in order. Changing a style was way too simple for me. There's not much opportunity to be original. The neighbourhoods are... disappointing at best. Yes, I realise that they are small so that players with low-end machines can run the game. But there simply wasn't a whole lot of choice when it came to picking a house for her, and I didn't want to start out building a house from scratch. I tend to get carried away and she didn't have a lot of funds to begin with. I'm aware that I could've used a cheat, but trust me, after 15+ years of playing The Sims, cheats get old. To me anyway. I decided to move her in one of the few available lots. If memory serves me, there were 2 or 3 affordable options in "Oasis Springs" the world I chose to play. Shortly after she moved in, a bunch of Sims arrived to welcome her to the neighbourhood. Things progressed and at the end of the day, she had some friends and a job. Over the next sim-week, she went to work. I thought it was difficult to maintain friendships during the work-week, considering I wanted her to move up in the world and she also had to work on her mood, skills and daily task. A lot of things took way too much time, so by the time she had taken care of her basic needs, there was barely enough time to work on skills and/or daily tasks. Never mind having a friend over. Those friends also tended to message her at unholy hours to see if she wanted to hang out, only to leave within minutes on the rare occasion I took them up on their offer. I remember this was also quite a struggle in the original "The Sims" game, at least until you could afford better buy mode objects. But at least those sims didn't die eventually, and I had the impression that it's going to take a generation for them to afford better things, and how is that new generation ever going to come if there's hardly time to meet and befriend sims? Loading screens ... really? I love the type of "open world" that we know from TS3. Again, I realize that loading screens make it easier for low-end PC's to run the game, but no. Just no. Some familiar, and some new. This is the only way in which, in my opinion, the game is an improvement over the previous titles. I like the "mood" system and the accompanying social interactions. There's definitely more realism here, like having a meal in front of the TV, or playing mobile games on the toilet. Not much can be said here. Pretty straight-forward indeed. It's different from previous games, but not too shabby. I would probably get used to that within a few hours of building. Unfortunately create-a-style is, again, lacking in this department. Graphics aren't that much of an improvement, to be honest. The Sims themselves look a bit more "shiny" than the previous games, but not so much that it is actually noteworthy. The same goes for the rest of it, really. The houses, furniture and textures aren't "amazing'. The lawn looks like a sort of green "blob" at best. A step down from the grassy texture of the lawn in TS3. I didn't look much further, but the sand texture in Oasis Springs didn't look much better. Apparently there is none whatsoever. I imagine other sims in the neighbourhood/game do age up, but that's it. This is game breaking for me. I remember playing The Sims 2 and it annoyed me that neighbourhood sims don't age up or progress at all unless you take an active hand in that. I'm not a rotational player. Yes, I like to switch households from time to time, but I do not want to manage progression for an entire town. I still played the game, but I never looked back after The Sims 3 was released. Though progression in TS3 was far from perfect, it didn't require a large amount of micromanaging. And when I discovered Nraas, and their StoryProgression mod (along with a few of their other fantastic creations), it was like a dream come true, sims-wise. Imagine my disappointment when I found out that non-household Sims don't really progress much in TS4. I imagine they form a few friendships when they are chatting down to each other down the street, but I noticed that my friends didn't get promoted, they didn't form romantic relationships. I imagine they don't get married and have children by themselves either. Even with the mod MC Command (and all its modules), it is far from ideal. I can be short: I'll stick with TS3! Is the game worth it? Absolutely. But as a person with little time, I get to be picky. And with so little time, playing TS4 is just going to take away from playing the better game, in my opinion. Als jij je aanmeldt voor Yoors krijgt Edin 100 Yoors Points en jij krijgt er zelf ook 100.